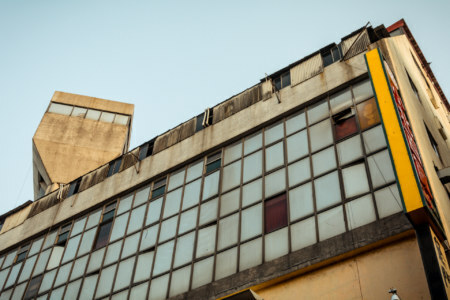 An abandoned entertainment complex not far from Douliu Station. While living down in Changhua City 彰化市 last winter I made occasional forays up and down the TRA Western Line 西部幹線 to scope out places not commonly written about in English. One such place is Dǒuliù 斗六, the administrative seat of Yúnlín 雲林, which hardly earns more than a passing mention in the English language blogosphere. 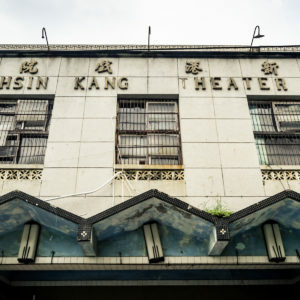 It was a worthwhile trip too—apart from the famous Tàipíng Old Street 太平老街 and the surprisingly large and lively Douliu Night Market 斗六夜市 I also chanced upon another abandoned cinema to add to my growing collection: Shuāngzǐxīng or Gemini Theater 雙子星戲院. A closer look at the distinctive elevator shaft. Also notice the signboard for Gemini Theater immediately to the right! A long view of the side of the decrepit structure. 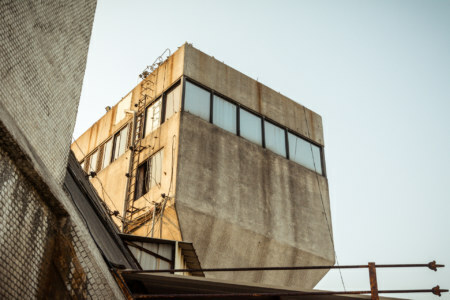 An oblique view of the “head” of the building. 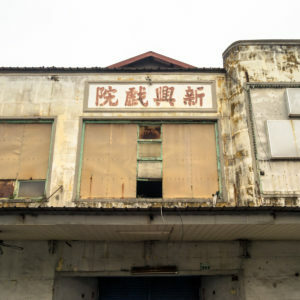 Since I began getting out and exploring more of central and southern Taiwan I’ve developed something of a pet theory: there’s a very good chance you’ll find an abandoned entertainment complex or commercial building much like the Qiáoyǒu Building 喬友大廈 near the train station in every sizable settlement on the railway line1. 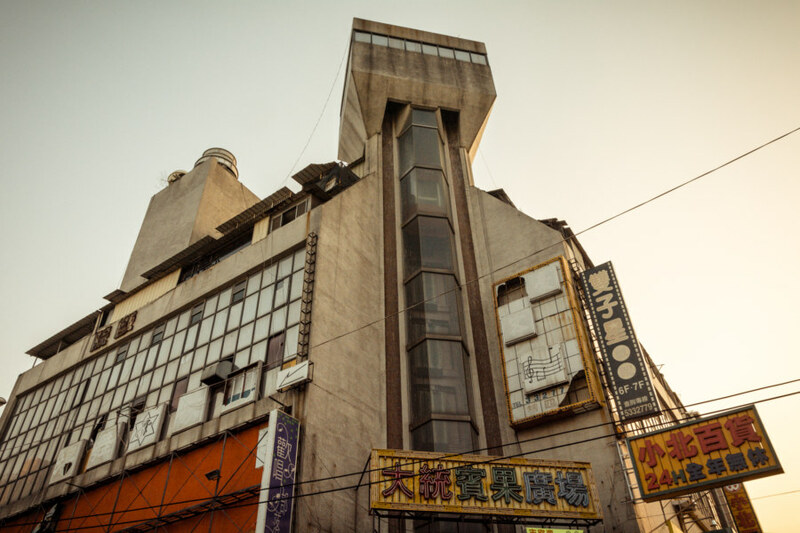 Sure enough, after five minutes of poking around the cramped streets south of Douliu Station 斗六車站 I came upon an oddly shaped and obviously abandoned building with a sign out front that reads Dàtǒng Bingo Plaza 大統賓果廣場, doubtless the name of a former gambling den. 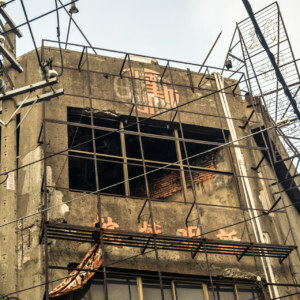 Since then I’ve learned this hulking ruin is officially known as the Dòuliùmén Building 斗六門大樓, named after an archaic term for the area dating back to the 17th century. 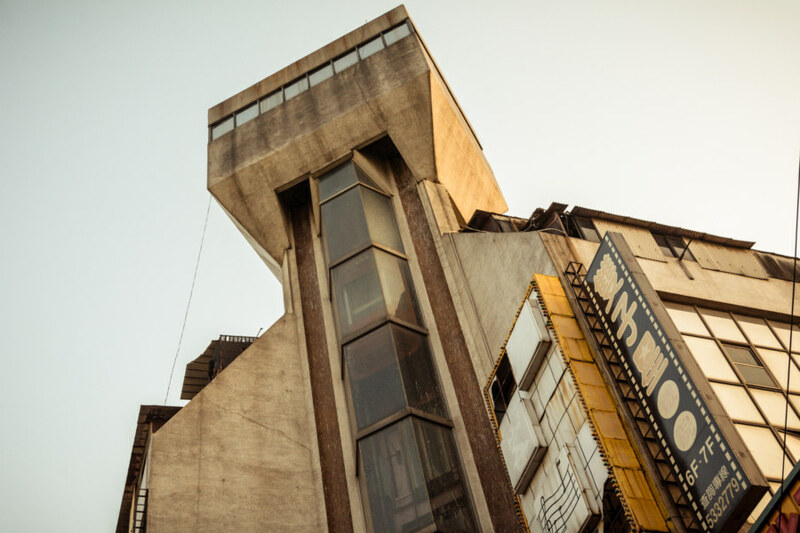 Not long after spying this structure from the street I was scaling one of the outer stairwells in search of what might be seen. The old Gemini Theater ticket booth on the ground floor probably looks pretty much as it was for many years. On the seventh floor an open door beckoned me inside. Here I encountered the remains of an old movie theater stripped down to the floorboards. 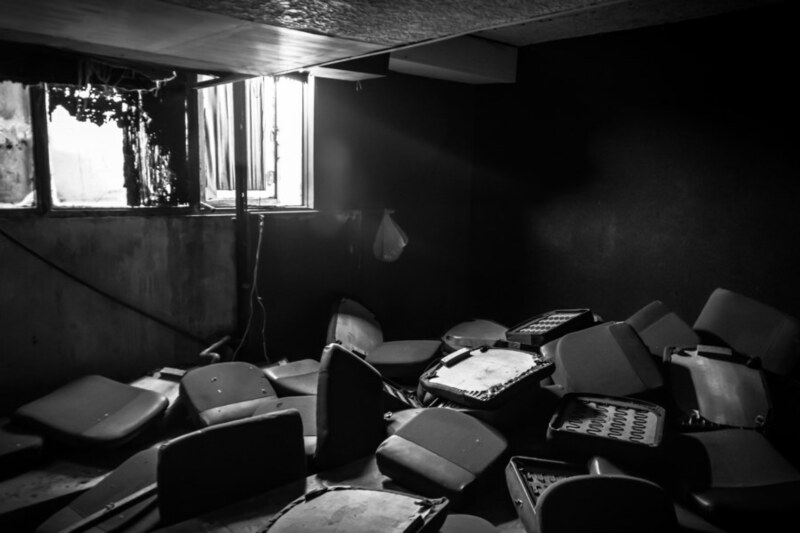 Red seat cushions, once stacked in neat piles, were scattered around the dimly lit room. I turned a corner and entered the projection booth. 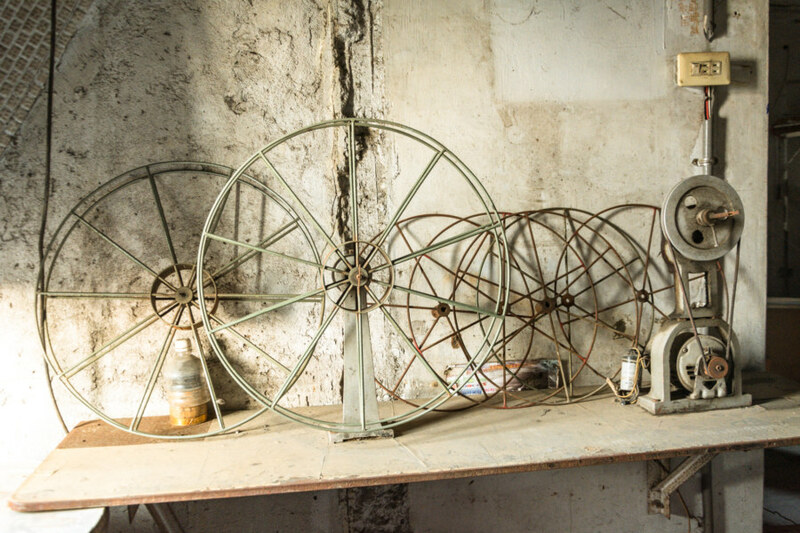 Not much had been left behind, just some old film spools and the detritus of many passing years. Peering through the square holes in the wall into the theater beyond I imagined how it might have looked when the light of the very last film splashed across the screen. Usually I am left wondering about those last moments—but not this time. 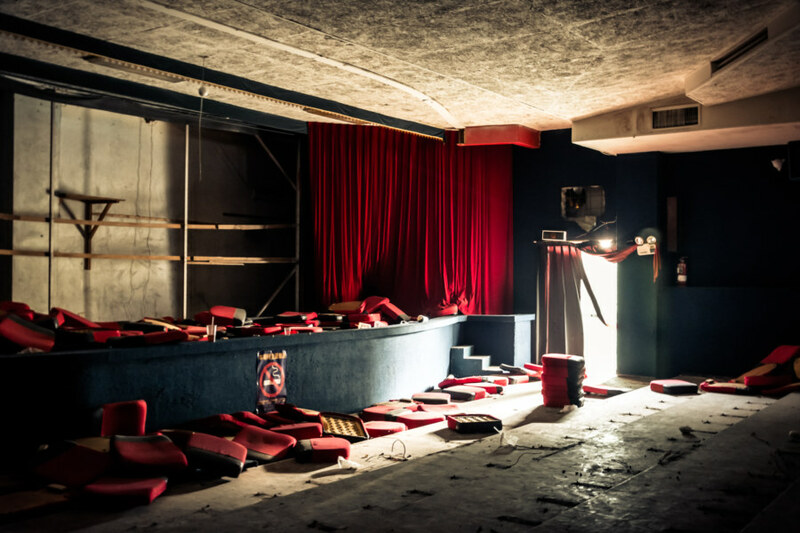 With a bit of sleuthing around I uncovered the story of this theater’s dying days. All the seats have been stripped off and gathered into small heaps. It is dark and musty inside the old Gemini Theater. 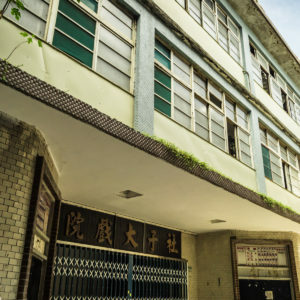 Gemini Theater 雙子星戲院2 opened in 1981 in the midst of the boom times of the Taiwan Economic Miracle 台灣奇蹟 and must have prospered during democratization. 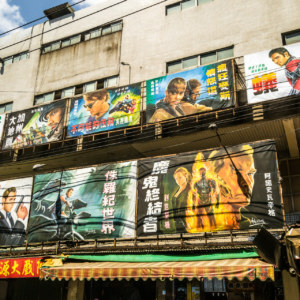 By the 2000s movie theaters all around Taiwan were struggling with competition from other forms of entertainment (video games, for instance) and piracy, both of which were causing audiences to dwindle. 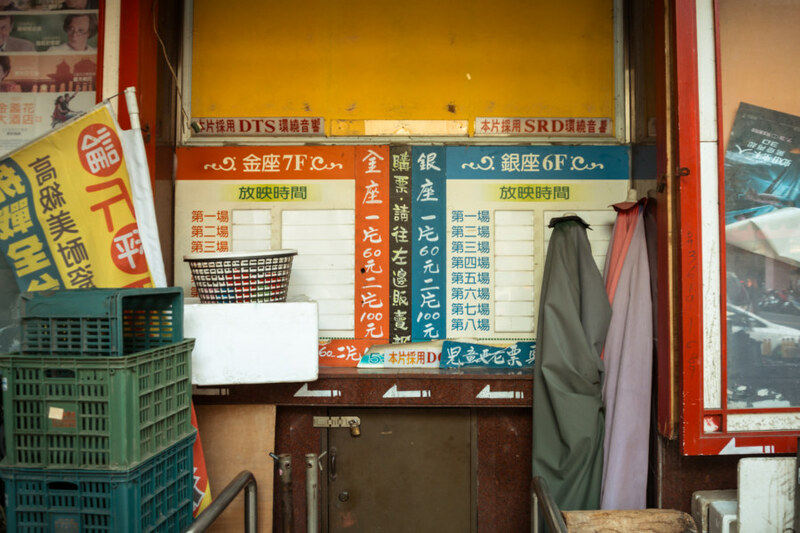 This particular theater moved downmarket, much like the Chin Men Theater 全美戲院 in Tainan 台南, transforming itself into a second-run theater selling double feature tickets for the modest sum of 100 NT (about USD$3) near the end of its lifetime. 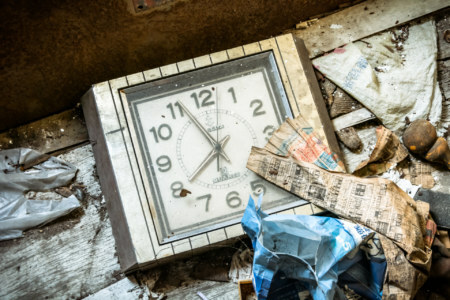 This was not enough to halt the decline—and when the entire building was sold to new owners it looked as if the theater’s days were numbered. 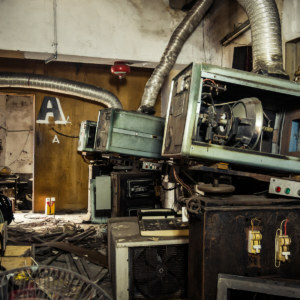 Inside the projection room at the old Gemini Theater. Discarded reels in the projection room. Eventually all employees were let go—there simply wasn’t enough money to pay anyone and the new landlords weren’t willing to lower the rent. 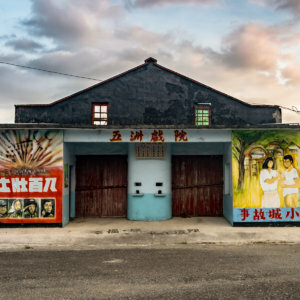 The theater would have shut down entirely were it not for the tireless efforts of Wáng Gāngyì 王剛毅, a former employee in his mid-60s with a passion for cinema. Working entirely for free3, he single-handedly sold and checked tickets, ran the projector, cleaned up hundreds of seats after each showing, and even hand-painting billboards and signs. 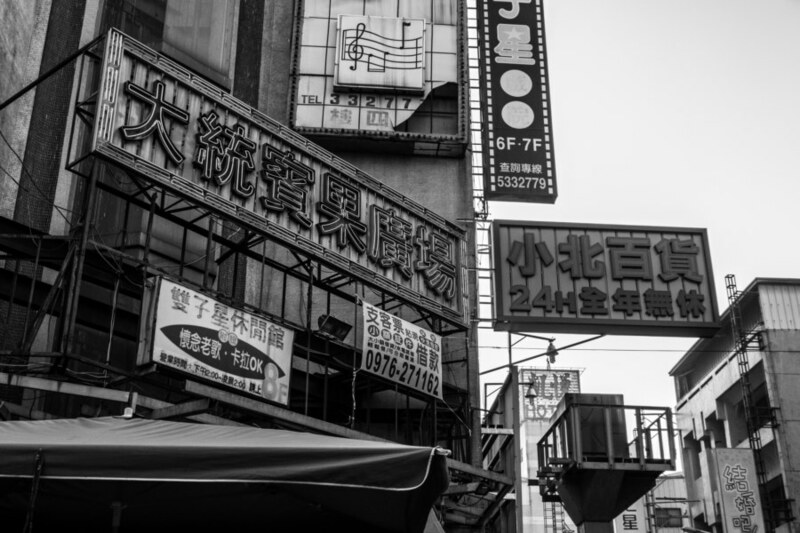 This, in turn, attracted the attention of student organizations like Film Effects 膠捲效應, who shared this fantastic set of photos about efforts to save the theater. 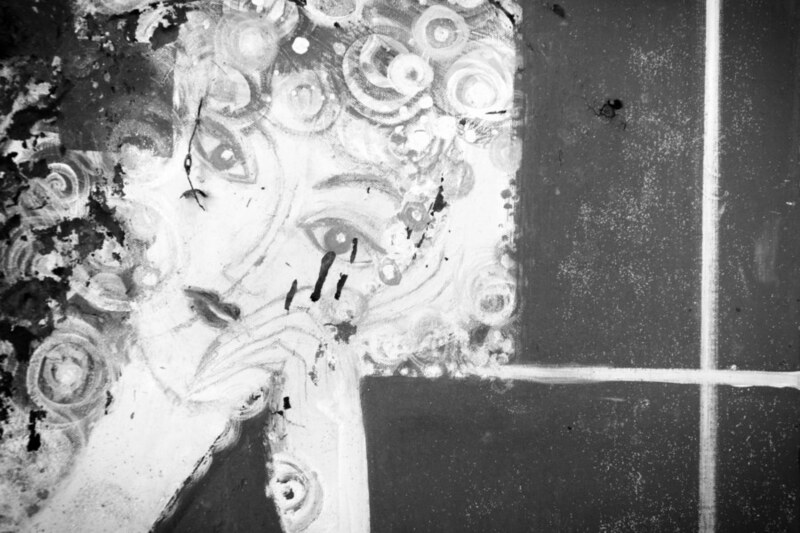 A series of videos was also released about Wang and Gemini Theater; watch them here, here, here, and here. 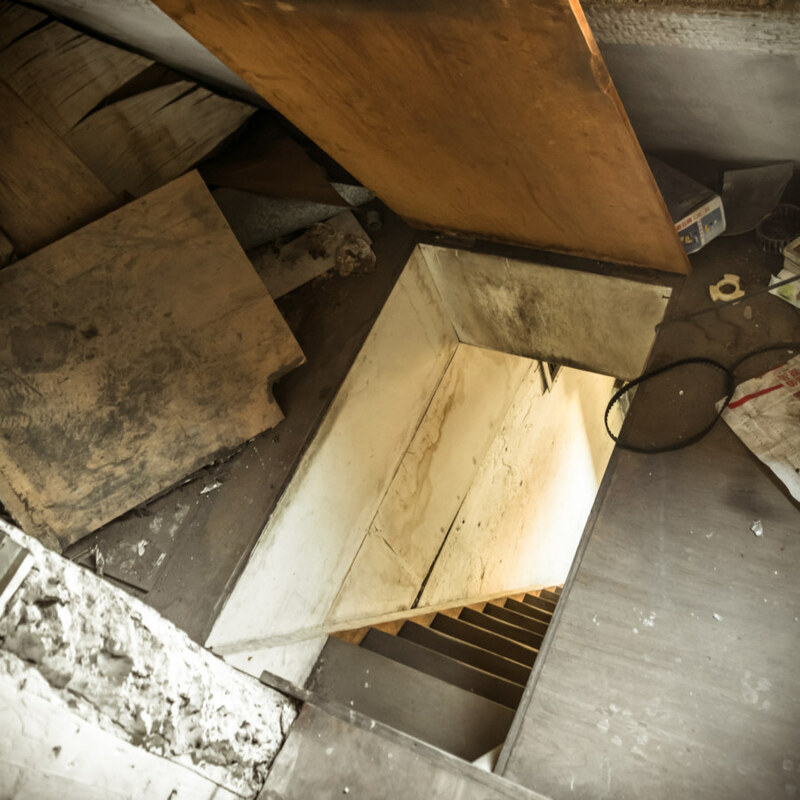 The trap door and rickety stairwell connecting the sixth and seventh floors. 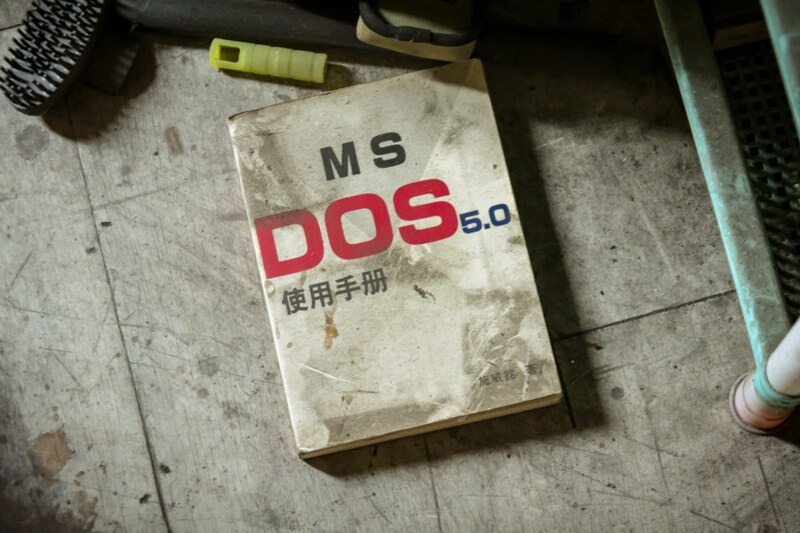 An abandoned MS DOS 5.0 operating system manual. A broken clock is right twice a day. No calendars in sight. 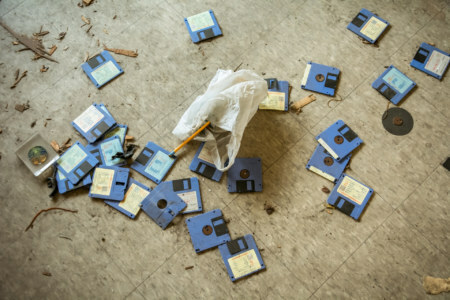 Floppy disks all over the floor. Media exposure and a groundswell of support from local film enthusiasts was not enough to save Gemini Theater. 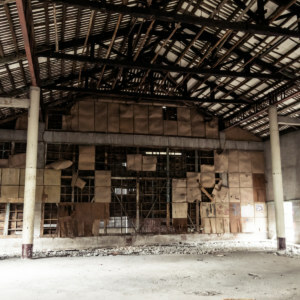 A final showing was announced in the summer of 2013—but, in a plot twist that would have been right at home on the silver screen, the building’s electricity was switched off without warning two days prior to the big event. 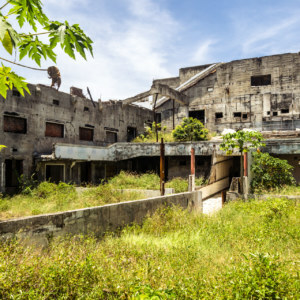 With the support of many volunteers Wang managed to pull it off somehow—and the last film was shown to a full house despite the dank summer heat and lack of air conditioning4. Someone lives on top of the old building so I wasn’t able to get any better shots up there. 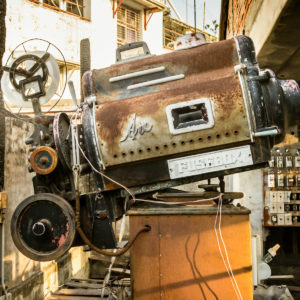 The story of the old man and the theater reminds me of Goodbye, Dragon Inn 不散, a Taiwanese film shot in a now-abandoned theater in Yǒnghé 永和 that I plan to visit one day. Read this review in the New Yorker for a preview. Here it seems fitting to quote one of the only spoken lines of dialogue in the film: No one goes to the movies anymore, and no one remembers us anymore. 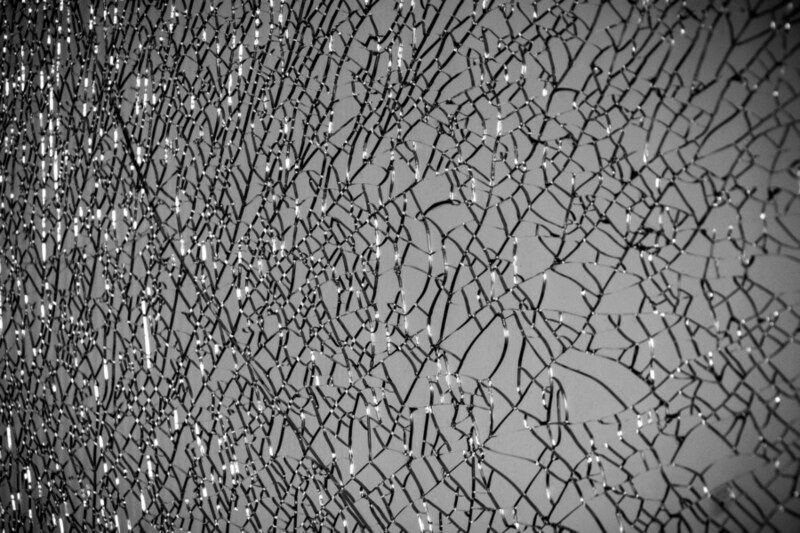 One room was divided by shattered glass partitions. I leaned in to take a somewhat abstract photo of the effect. Of course, I knew nothing of the history of the building while I was exploring it. I could discern only the barest outlines of the story—past prosperity, generational change, and terminal decline. 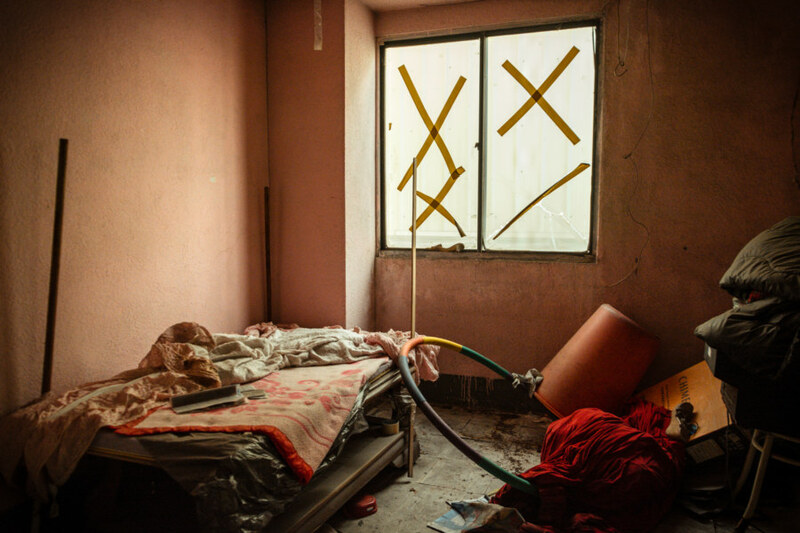 It was, at the time, just another abandoned building filled with unknowable stories, echoes of the lives of others. That I now have some insight into what happened there provides for a strange kind of remembering. 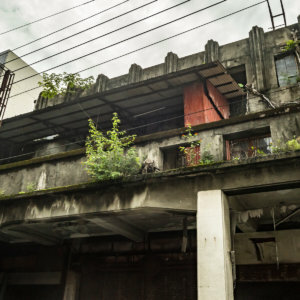 An abandoned apartment below the old theater. A rosy-hued apartment several levels below the theater provided me with another way of remembering. 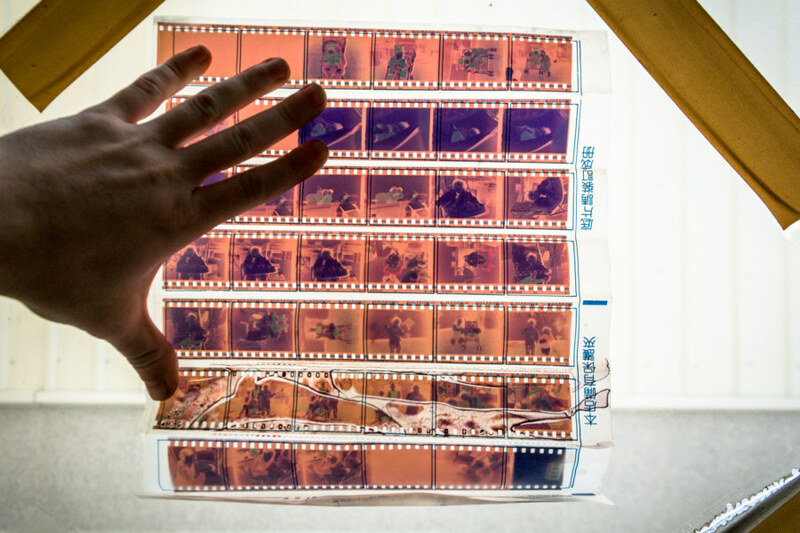 Here I found a small pile of photographic negatives laying on a cot. I unfolded a set and splayed them across the dusty window to capture their essence for later exposure. You can find the results of this exercise here. A window into someone else’s life. Another way of remembering. Found art in the outer stairwell of the Douliumen Building. 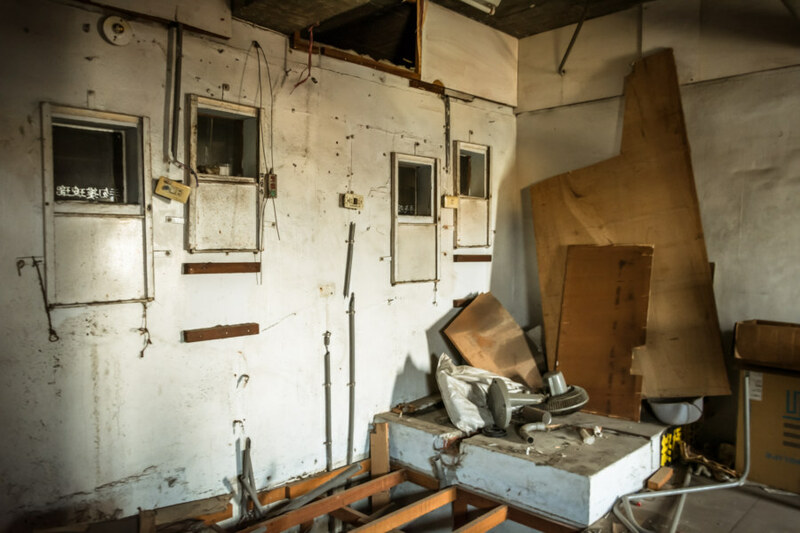 One last thing worth mentioning about this building is that it was recently damaged by Typhoon Soudelor 蘇迪勒颱風. 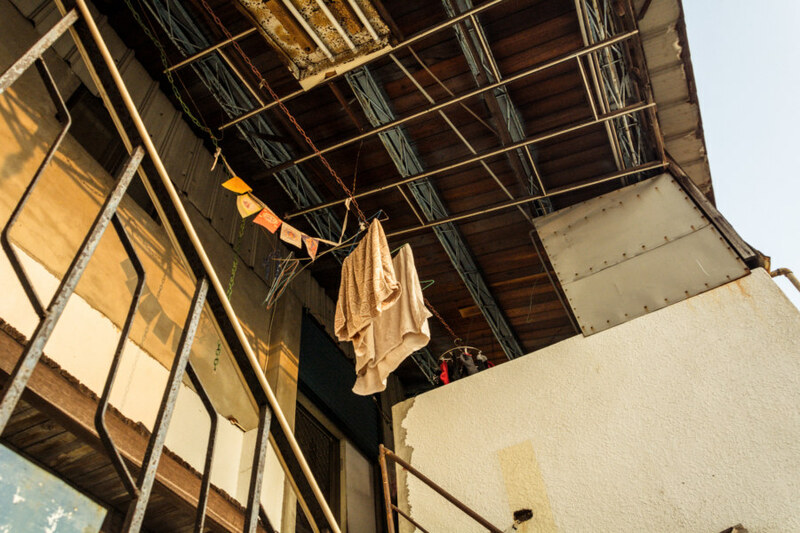 The news report mentions that permission had to be secured from the Taipei-based owners to remove a dangerous piece of metal hanging from the rooftop. For more photos from the theater before it closed have a look here and here.